Just 1% of the cost of Microsoft's headset, but how does it compare? Augmented reality is all very exciting, but it's mostly about potential right now with few actual consumer-ready headsets on the market. And if you want one, Microsoft's HoloLens Developer Edition is probably your best option... but that costs $3,000. Magic Leap? Ask us again in six months. 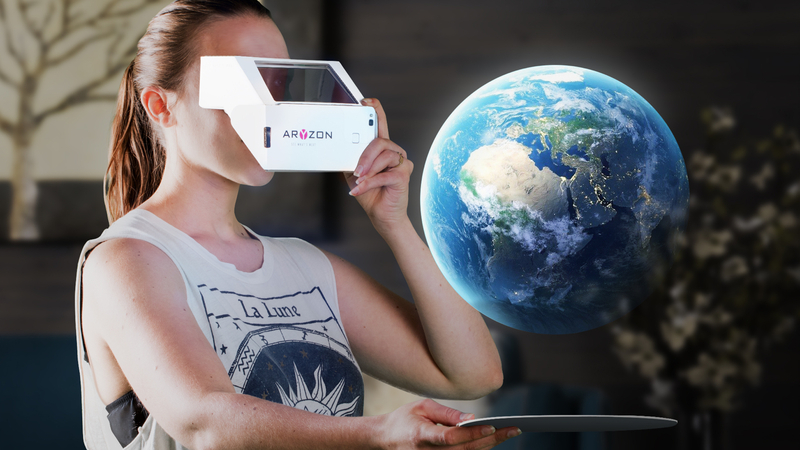 Enter Aryzon, the headset that's priced at $30 and wants to be the Google Cardboard of AR. Cardboard set out to prove that VR could be cheap and accessible to everyone, even if the experience wasn't quite as good as, say, the Oculus Rift, and Aryzon has a similar, distinctively budget look to it. You just need to put together the flat-pack pieces, slot in a smartphone and hold it to your face to start viewing holograms superimposed onto the real world. But how does it really compare to something like the HoloLens? "What you see through the Aryzon really is quite similar," said Maartan Sla, CEO of Aryzon. "The main differences with the HoloLens is in its use and interaction. The Aryzon will mostly be used for objects that are an arms length away from your body instead of further out and interaction, for now, takes place through marker objects and virtual buttons instead of hand gesture recognition." So in terms of interactivity it's more stripped down, but the quality of the holograms are promised to be good, and there are some images on the Aryzon Kickstarter page showing off what it should look like. The headset has already surpassed its $27,813 goal within a day, so there's a demonstrable interest here. Hopefully, we can see more devices like Aryzon to get AR on the faces of more people, but of course we'll have to wait and see how good the expereince really is. It'll ship this September. Sla promised we won't get motion sickness using the headset, but latency is going to depend on the phone you're using with it. He also said there are no plans to sell 3D content to people, but added that they're looking into doing a stretch goal that would add a head strap to the headset, which would reduce achy-arm syndrome in those longer play sessions.